The Star Trek franchise continues with its fifth spinoff television series, Enterprise. Set in the 22nd century (100 years before the stewardship of Captain Kirk), the prequel series charts the intergalactic adventures of the first humans to explore the far reaches of outer space on the eponymous Starship Enterprise NX-01. 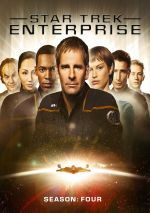 Ship commander Captain Jonathan Archer (Scott Bakula) leads his crew on a pioneering mission to chart new planets and alien civilizations at a time when the United Federation of Planets is in its infancy. John Billingsley, Jolene Blalock, Dominic Keating, Anthony Montgomery, Linda Park, and Connor Trinneer costar as Bukula's intrepid crew. 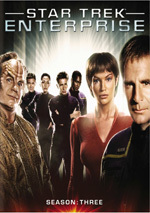 This collection includes every episode from the series' fourth and final season, which attempts to tie up loose threads and storylines from previous Star Trek incarnations. Because my full season reviews of Star Trek series tend to be long-winded, I’ll cut short the episode summaries. If you’d like to see my specific thoughts about each show from Season Four of Enterprise, please click this link. To summarize, S4 concludes the show well. It falters at times – primarily via an awful season/series-ending episode – but most of the year succeeds. It’s too bad Enterprise stopped where it did, as the show seemed to be coming into its own when it got cancelled. Star Trek: Enterprise appears in an aspect ratio of 1.78:1 on these Blu-ray Discs. After three years of episodes shot on film, Season Four made the transition to digital video. It did so reasonably well, as the shows usually looked fine. Sharpness was generally positive, though exceptions occurred, as some wide shots tended to be somewhat tentative. Nonetheless, the episodes mostly appeared accurate and concise. Jagged edges and shimmering created no concerns, and I also noticed no problems with edge enhancement. Source flaws appeared absent, as I didn’t discern specks, marks or other issues. The palette varied depending on the context of the episode. Much of the time the colors were a bit restrained, but sometimes they took on more dynamic tones. Overall, though, they were consistently strong. I thought the hues remained accurate and full within their design. Blacks seemed firm and deep, while low-light images gave us good definition and visibility. The occasional softness made this a “B” presentation, but it was still satisfying.. The DTS-HD MA 5.1 soundtrack of Star Trek: Enterprise also worked well. The audio stayed mainly focused on the front channels and created a good sense of life in that area. It used the forward speakers to form a realistic and rich feeling of ambience and moved elements about quite cleanly. As for the surrounds, they tended to echo material from the front. They became more active at times, especially during battles and fly-by shots, but they weren’t tremendously involving. Still, they were a bit livelier than during the first three seasons, as they created a pretty solid sense of setting. The Blu-ray’s extras mix old and new components. We get nine audio commentaries, three of which appeared on the DVDs. These cover both parts of “In a Mirror, Darkly” as well as “Terra Prime”. Writer Mike Sussman and startrek.com editorial director Tim Gaskill chat for “Mirror” while Gaskill and writers Judith and Garfield Reeves-Stevens discuss “Prime”. For the “Mirror” tracks, we got information about development of the story, character changes, connections to the Original Series’ “Mirror, Mirror”, technical challenges and the recreation of TOS sets, and little tidbits about the production. The pair offer a lively look at the show and dig into the elements well. We learn a lot about the episodes in this fun track. As for the “Prime” commentary, we get similar information. The participants discuss story issues, character growth and various technical and visual concepts. This offers a solid overview of the show and fleshes out the episode well. “The Forge”: Judith and Garfield Reeves-Stevens and Trek art designers/historians Michael and Denise Okuda. The track looks at story/character areas, visual design, aspects of the shoot and connections to other Trek series/tales. Though the commentary peters out as it goes, it usually stays pretty peppy and informative. “Observer Effect”: Judith and Garfield Reeves-Stevens and Michael and Denise Okuda. This one looks at topics similar to those for “The Forge”, so anticipate a similar vibe and feel. It’s another informative and interesting discussion, even if it does lose steam along the way. “United”: Judith and Garfield Reeves-Stevens and director David Livingston. With the addition of Livingston, the commentary’s focus broadens a bit from the prior two, as he adds a director’s perspective. This means a little more about the nuts and bolts of shooting the series, but the content usually remains consistent with the earlier track – and like those, it becomes a reasonably informative ride. Though it could be tighter, the commentary still brings out a good mix of notes. “In a Mirror, Darkly (Part 1)”: Mike and Denise Okuda, Mike Sussman and director James L. Conway. The usual array of topics pops up here, though we get a twist, as the commentary often concentrates on aspects of the episode’s “mirror universe”. That gives us a mix of insights that helps this become a solid chat. “Demons”: actors Conner Trinneer and Dominic Keating. I like the breezy chemistry Trinneer and Keating share, and they provide some fun notes about their experiences with Trek. Unfortunately, they don’t seem to remember much about the episode itself, so the track sags more often than I’d like. “Terra Prime”: Trinneer and Keating. Expect this commentary to resemble the chat for “Demons”. Once again, the actors start well but fade pretty quickly. This means occasional tidbits of interest but not much meat. As with the prior Enterprise packages, text commentaries by Michael and Denise Okuda come with three episodes. We find these tracks for “The Forge”, “In a Mirror, Darkly (Part One)” and “These Are the Voyages”. Don’t expect surprises from this presentation, but that’s a good thing, as the Okudas always offer strong text discussions. They write about set design, cast and crew, visual effects and stunts, connections to other Trek series, props, and factual details. As always, these give us good background and notes as they help tie in the episodes and the series to the bigger world of Trek. “Mirror” tosses out lots of elements about how the show tried to recreate the Original Series, while “Voyages” summarizes Enterprise and Trek as a whole. The text tracks are valuable additions to the set. Three episodes come with deleted scenes. These accompany “Storm Front Part One” (one scene, 2:45), “The Aenar” (one scene, 0:53) and “In a Mirror, Darkly Part Two” (one scene, 2:28). The clips for “Front” and “Mirror” offer short extensions of existing sequences and don’t seem terribly interesting. However, “Aenar” presents an intriguing coda for the Romulans and is more worthwhile. The Blu-ray adds an extended scene for “Home”. It runs one minute, 17 seconds and features an awkward conversation between Trip and Koss. It delivers material of mild interest at most. Also alongside “Home”, we find a Script Gallery. This shows screenplay pages that let us see the episode’s original ending. Though the lines can be a little difficult to read, this still turns into a fun extra. On Disc One, we locate Enterprise Moments: Season Four. It uses show snippets, behind the scenes bits and interviews. It runs 16 minutes and 26 seconds and includes comments from Garfield and Judith Reeves-Stevens, co-executive producer/writer Manny Coto, actors Scott Bakula, Connor Trinneer, Dominic Keating, John Billingsley, Jonathan Frakes and Marina Sirtis. They discuss “Zero Hour”, “The Forge”, “Borderland”, “Terra Prime”/”Demons”, and “These Are the Voyages”. We get notes about resolving the cliffhanger, developing Vulcan lore, bringing Brent Spiner on as a guest, launching the Federation and concluding the series. These details give us a nice wrap up for the season and Enterprise, as they provide good details about all of these topics. I also really like the shots from the set that feature Spiner and director LeVar Burton. 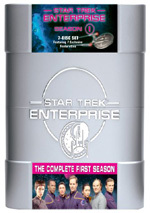 Disc One opens with ads for Unification, Enterprise Season 2 and Enterprise Season 3. Found on Disc Five, Inside the “Mirror” Episodes lasts 15 minutes, 42 seconds and includes remarks from Coto, Sussman, illustrator Doug Drexler, makeup designer Michael Westmore, digital effects supervisor John Teska, and visual effects producer Dan Curry. We learn why there’s no crossover element to “Mirror”, how the series almost included William Shatner, the development of the “Mirror” story, designing and building replicas of the TOS sets, creating other elements like costumes and creatures, and redefining characters. A little of this information repeats from the text commentary, but not too much. Instead, we get a fine exploration of the treats and challenges of “Mirror”, and we see many interesting behind the scenes bits to flesh out the program. The remaining pieces appear on Disc Six. Enterprise Secrets fills five minutes, 53 seconds. 2nd AD David Trotti leads us through the last day of shooting and shows us all the crewmembers who make cameos. It’s a nice way to look at these folks when they step in front of the camera. For the 13-minute and 27-second Visual Effects Magic, we get comments from Curry, Teska, 3D artist Fred Pienkos, visual effects supervisor Ronald B. Moore, lead 3D modeler Pierre Drolet, and digital effects supervisor Robert Bonchune. We learn about recreating an alternateWWII for “Storm Front”, motion capture and CG for the insectoid Xindi and the Tholians, the new Columbia ship, and the “superweapon” that attacked the Earth. Although light on real details, “Magic” runs through the various issues well. It gives us the most necessary facts about the effects and proves entertaining. Next we get the nine-minute and one-second That’s a Wrap. This takes us to the wrap party that markd the end of Enterprise. We hear some remarks from Keating, Billingsley, Bakula, Mike and Denise Okuda, co-creators/executive producers Rick Berman and Brannon Braga, and actors Anthony Montgomery, Linda Park, Peter Weller, Jeffrey Combs, LeVar Burton. Inevitably, it’s a goopy lovefest, though one tempered by some bitterness related to series’ cancellation. It’s interesting mainly as an archival piece. Connections to other Trek appear in Links to the Legacy. The four-minute and 27-second piece presents remarks from Garfield and Judith Reeves-Stevens as they discuss how Enterprise tied to aspects of the Original Series as well as DS9. We’ve heard some of this elsewhere, but it adds a nice recap of those issues. During Enterprise Goes to the Dogs, we find a 12-minute, 44-second piece with Berman, Braga, Curry, Bakula, Billingsley, Mike Okuda, Keating, Bormanis, Trinneer, Sussman, illustrator John Eaves, and animal trainer Scott Rowe. The program looks at the decision to add a canine companion to the series as well as aspects of working with the beagles. It’s a light piece but it gives us some decent notes about the topic. Westmore’s Aliens: Creating Dr. Phlox and Beyond lasts five minutes, 18 seconds and features comments from the makeup designer. He discusses the design of the Phlox character and all the challenges that came along the way. This becomes a short but sweet look at the subject. In two minutes and 17 seconds of Outtakes, we get the usual goof-ups and silliness. Don’t expect anything more interesting than that. NX-01 File 10 includes remarks from Trinneer, Bakula, fans Tim Brazeal, Chuck Ballard, Alexandra Wojciechowska, and Stewart Nielson, and runs four minutes and 43 seconds. We see the rally in front of Paramount organized in an attempt to save Enterprise. A Photo Gallery provides 62 images. These mix publicity shots with behind the scenes stills. It adds up to a decent collection. Disc Six also includes two programs new to the Blu-ray. The four-part Before Her Time: Decommissioning Enterprise lasts a total of one hour, 55 minutes, and 50 seconds. It presents comments from Coto, Braga, Sussman, Judith and Garfield Reeves-Srevens, Bakula, Michael and Denise Okuda, Park, Conway, Billingsley, Trinneer, Combs, Keating, Montgomery, Berman, Livingston, co-producer Andre Bormanis, former Star Trek Communicator magazine editor Larry Nemecek, and actor Jolene Blalock. “Time” looks at S4’s various story/character arcs, changes behind the scenes, ratings/budget/network issues, guest stars, episode specifics and unused ideas, cast and performances, the series’ cancellation and its impact on the year, and reactions to the series’ end, and valedictory thoughts. “Time” offers the longest of the Enrerprise documentaries – and it might be a little too long. Don’t get me wrong – we find plenty of good content here, especially when the program looks into season specifics and reactions to the cancellation. Nonetheless, “Time” could’ve been tighter, as I think some of the segments ramble a bit. It’s a good overview, though, and well worth a look. In Conversation: Writing Enterprise goes for one hour, 29 minutes, and 52 seconds as it presents a panel with Bormanis, Judith and Garfield Reeves-Stevens, Sussman, Braga, consulting producer David A. Goodman, co-executive producer Chris Black and writer Phyllis Strong. They let us know how they came to Enterprise and relate various experiences over the years as well as thoughts about the series and specific episodes. Expect an informative, fun chat here. The participants – led by Braga and Goodman – keep the session peppy and chatty, and we get quite a few good notes about the series and the writers’ POV. Almost 90 minutes of this conversation almost feels short; I’d love to have heard more from these folks. 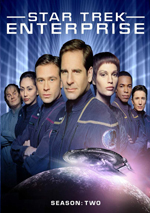 When I started with Season One, I went into Enterprise with fairly low expectations, but I must admit I rather liked it. It developed into something different within the Trek universe and was getting better when it got its premature axe. Season Four offered a lot of unusual threads and worked pretty well. The Blu-ray provides positive picture and audio along with a strong collection of bonus materials. Enterprise finished on a positive note and the Blu-ray package represents it well.